Schurr posted its first victory of the 2012 season by defeating Whittier. California remained undefeated by winning at Warren. La Mirada, meanwhile, improved its Suburban League record to 2-0 with a win at Bellflower. Welcome to week 5 action. We have eight games scheduled for tonight. Whittier will look to improve to 4-1 as it hosts Schurr. La Mirada, meanwhile, continues its Suburban League schedule against Bellflower. Also, California will seek to remain undefeated as it takes on Warren. Cantwell Sacred Heart at Bishop Montgomery, 7 p.m.
La Mirada at Bellflower, 7 p.m.
Schurr vs. Whittier at Whittier College, 7 p.m.
California at Warren, 7 p.m.
Pioneer at Laguna Beach, 7 p.m.
Santa Fe at Chaparral, 7 p.m.
Servite at St. Paul, 7:30 p.m.
Whittier Christian at South Region 2, 7 p.m.
LA MIRADA – La Mirada High School ran into early roadblocks, but finished strong to defeat Cerritos in five games (20-25, 23-25, 25-19, 25-11, 15-12) in Thursday’s Suburban League girls volleyball action. Armed with momentum from winning the third and fourth games, La Mirada raced out to an 11-5 lead in the deciding fifth game. Sara Hickman made four kills during the Matadores’ surge that also produced an ace from Selena Cartznes. Cerritos, which into the match undefeated in league action, put together one last rally as it won five consecutive points. Stephanie Malouf and Arnelle Duru led the Dons’ run, each making two kills. But the Dons would draw no closer. La Mirada scored the next three points to move within match point. The Dons then cut the Matadores lead to 14-12 on Duru’s kill and a La Mirada error. The Matadores, however, secured the victory on a Cerritos serving error. Hickman paced the Matadores’ attack with 16 kills and Valerie Montoya had 12 kills. Matadores setter Kyli Watkins contributed with 40 assists. I barely cleared the .500 mark in week 4, posting a record of 6-4. We shall see how week 5 develops. 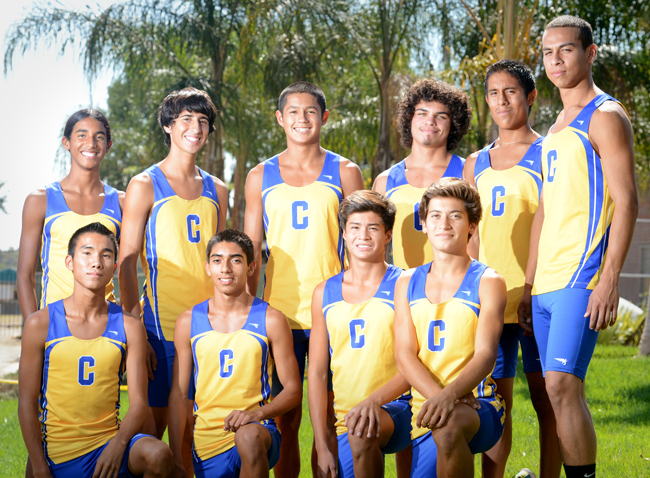 The California High School boys cross country team has experienced early season success, which has helped the Condors achieve a No. 7 ranking in the latest CIF-Southern Section Division 1 poll. The Condors hope their promising start will lead to things much bigger than just a Top 10 rating. On Sept. 8, California captured first place at the Great Cow Race in Cerritos by posting a school-record team time of 75 minutes, 59 seconds. A week later at the Woodbridge Classic in Costa Mesa, the Condors took sixth place in the sweepstakes race with a mark of 76:01. “We ran pretty much the same time two weeks in a row,” California coach Tony DiMarco said. “That’s pretty good. The sweepstakes race (at Woodbridge) is a quick race. It’s nice to get into a big meet like that and be able to run well. California’s top runners include juniors Jose Pacheco and Matlazomatli Rojas and seniors Sam Bautista, Leo Corcoran, Steven Vera, Joshua Roldan and Chris Ramirez. Pacheco has already run a personal-best race of 15 minutes this year. Other 2012 personal records already set include Corcoran, 15:11; Bautista, 15:14; Rojas, 15:16; Ramirez, 15:17; Vera, 15:19 and Roldan, 15:20.